A week or so ago I published several posts about the mysteries and centrality of the cross of Christ. We recommended a few books of varying viewpoints and of different tones. This, of course, is dear to the heart of the redeemed, and it is good to often revisit the core claims of the gospel. Justification by faith is surely one of these topics about which we can always learn more, always find new ways to describe, and deeper reasons for praise, adoration and faithful response. We noted that N.T. 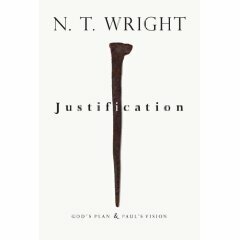 Wright’s book on justification, Justification: God’s Plan and Paul’s Vision (IVP; $25) has been long awaited by many of us, and particularly so after the hefty critique offered by John Piper in his book 2008 The Future of Justification (Crossway.) We offered to take pre-orders at a 25% discount. Now, the wait is over: the new N.T. Wright volume is here, and it will surely be one of the most talked about theological books of the year. It is rigorous and thoughtful, of course, but not only for the academic or theologically mature. This is a book for us all, serious, in-depth, but accessible. I am sure you will be reading about it, hearing about it, and, hopefully, will be able to form an opinion yourself. It is, in our opinion, one of those books that is worth owning and working on. Here are some blurbs that adorn that back. I love ’em, and enjoy knowing that it is commended by such an august crew. Books that create this sort of buzz, that are seen as this significant, don’t come around that often. We are pleased to offer it to you. exegesis of specific passages in Galatians and Romans in particular. Here is a good interview with Wright. Reading it, you’ll surely want to get the book. This entry was posted in BookNotes by Byron Borger. Bookmark the permalink. I too have been waiting for this book and explore how Wright digs into the Word in addressing the current (but ancient) conversation. Would love to have some book discussions on-line and in central PA. Any interest? Maybe we could work on co-hosting Wright sometime in the coming year. a publishing event here—how exciting! I smell a book of the year.